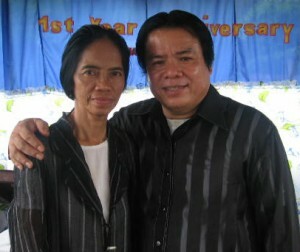 Biography: Alejandro, who likes to be called Loloy and Dorothy serve as leaders of a thriving cell church in the Philippine metropolis of Cagayan de Oro City (the biggest and most productive city in the archipelago). Through adversity, a church building burning to the ground, and a mere 6 - 7% Christian population nearby, the Lapiz's demonstrate an ability to overcome obstacles to go on preaching the Gospel through outreaches, radio, television, tract distribution, and cell Bible studies. Loloy also has an open door to minister in local schools and to local police officers. Strengths: Loloy and Dorothy both preach and conduct Bible studies. They preach the Word of God on the radio together. Family: Loloy and Dorothy have three children, Joseph Hope, Mary Joy, and Michael Frank.